I received many of these items for promotional purposes. As always opinions are honest & solely my own. This post also contains affiliate links. Easter is the holiday that makes me realize how blessed I am with family. It seems like every year there’s a new little (or four) added to my Easter Basket list. It used to be simple when all of the littles on my list were small. I would pack the baskets with pretty much the same items and call it a day. Now my list ranges in age from one to thirteen. With such a large difference in ages, the contents of the baskets have to differ. This might mean more work for me but it also puts me in a unique position. I can pretty much help ALL parents pack their baskets with treats their littles are bound to love. So sit back relax and start making a list based on what I’ve included in the ten baskets I’ve made so far. GirlzNDollz – I found this company on Instagram after missing them at Toy Fair and fell in love. Not many people know this but when JustaBXgirl was a baby I wanted to start a fabric doll company. It still might happen one day but today I am excited to have found this company that creates beautiful, soft, fabulous and affordable dolls. They come in various sizes and make perfect centerpieces for baskets. Splashlings – JustaBXgirl has been a fan of these for a while so adding a Shell Time Playset and some blind bags to her basket were a no-brainer.The playset is a great take-along toy because it doesn’t take up much room at all. Each playset comes with one mermaid, two Splashlings and, room accessories. Armitron Chronograph Sportswatch – When building a basket for the teen I have to make sure that she knows that I know she is no longer a baby. This year her centerpiece is a beautiful timepiece from Armitron. It is adult enough while still being cool enough for her to love and it is at an affordable enough price point that if something happens to the watch my heart and wallet won’t break. DVDs – Another good addition to baskets are DVDs that you know the little would love. It’s one thing for a little to be able to turn on and stream a movie but there’s nothing like being able to physically hold a CD and know that it is yours! This year, PBS has me covered with WordWorld – Let’s Eat, Wild Kratts – Madagascar Madness, Mister Rogers’ Neighborhood – It’s A Beautiful Day Collection and PBS Animals With Cameras. You know you hope someone adds the Mister Rogers one to your basket! Mash’Em Hatch’Ems Chicks – They come in an egg with nest! How much more can you ask for in an Easter Basket? Just don’t expect a chick to come out of these eggs. You will find yourself the proud owner of a squishy dino. Chicks With Wigs – If you’re looking for a chick to add to the basket look no further because these are quite the buzz. And they’re so darn fabulous. I think they’re something else that the teen/tween crowd can get behind. Cakepop Cuties – These are just too sweet and squishy. Did you know that squishy toys were currently all the rage? These are a great addition to any treat and make a great substitute for candy in the Easter basket! Mash’Ems and Fash’Ems – These are great treat gifts. 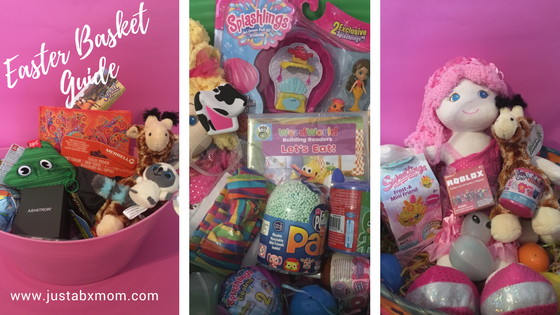 I have used them for school treat bags, stocking stuffers, birthday loot bags, Valentine’s gift bags and now easter Baskets! Can you tell I like them? For the Easter baskets, I used My Little Pony and Power Rangers. KOOSH balls – Do you remember these? They are exactly the same and exactly as much fun. I figured they were the perfect addition to the teen basket but they really could have fit in anywhere. It is taking great willpower not to keep it for myself! Potty Time Daniel Tiger – This is another great centerpiece. And perfect for the little working on mastering potty training! It sings the potty song so your little can remember what to do. ZIPIT – We’ve been a fan of these since gathering school supplies last summer. I got to see what new things they had up their sleeves during ToyFair and just knew these had to make it into my Easter Baskets. They were just so adorable. One more win for the teens and tweens baskets even though everyone would love them. Busch Gardens Giraffe Plush – When we attended the Busch gardens event last month they gave us the softest, cutest plushie giraffes from Aurora. when I shared that I had a dozen or so Easter baskets to make they gave me giraffes to include in each! They are a great gift for everyone and I have one sitting on my desk reminding me that we need a vacation soon! Playfoam Pals – As if playfoam wasn’t fun enough now it comes with a pal hidden inside! These are going to be a new favorite of ours to collect. Spirit Ride Free Promo Items – We went to a really fun event the other day at GallopNYC to celebrate Netflix’s Spirit Riding Free’s 4th season. I included chapstick and bookmarks in the baskets for the bigger littles. You can see some of the fun giveaways in the teen’s baskets.